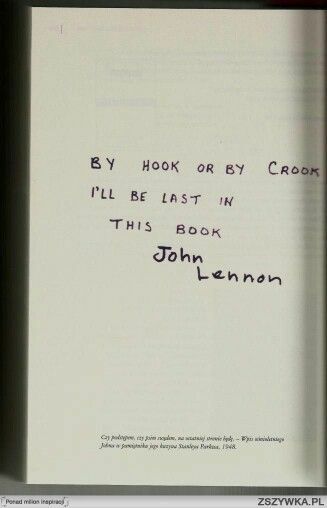 I've always wondered what the source was for John's quote "By Hook Or By Crook I'll Be The Last In This Book" on the last page of the Anthology book. I've scanned the photo credits etc so many times without any luck...does any one have any ideas? Challenge LuvLennon in the Arcade! Re: By Hook Or By Crook ! <font size="2" face="Tahoma, Arial, sans-serif">That quote is a Lennon original, written when he was a boy. It is assumed the quote is in his handwriting, probably taken from The Daily Howl, a comic he wrote as a youngster. Challenge Johnna Lynn in the Arcade! Thanks Johnna Lynn! I thought the writing looked like a younger John! I do love the way it was placed on the very last page! <font size="2" face="Tahoma, Arial, sans-serif">You are welcome, LuvLennon! It is nice to know someone placed that quote at the end Of Anthology with care. By Hook or By Crook is an old cliche meaning "by any means possible, be it fair or foul." I don't know the origin, but Sleepy might. She has extensive knowledge of cliche origins. I sometimes write that in yearbooks! lol! As far back as Mosaic times, the less fortunate members of society (widows, orphans, the elderly, and the lame) were by law free to pick up whatever harvested items fell to the ground behind those who harvested the crops for the wealthy, so long as no extraodinary efforts on the part of the unfortunate were required other than bending over and picking them up. It was quite illegal to actually pluck from the plant or tree itself, as anything still attached belonged to the landowner or crop owner himself. Of course, those who couldn't bend over for themselves, for presumably health reasons, were allowed to use their walking staff. Being mostly shepherdic societies, those disabled who found themselves in need of such a staff were also normally too disabled to cut themselves a new staff, and would use their old shepherd's staff. To use the staff legitimately was okay - but those who didn't need the staff were guilty of using extraordinary means. In medieval times, the laws of the land also entitled the destitute to fruits and nuts that had fallen naturally from the trees in the landowners' orchards. While it was perfectly okay to "hook" the fallen fruit, it was decidedly illegal to use the crook-end of the shepherd's staff to shake the live fruit from the trees. An interesting side note: another derivative of the old "by hook or by crook" was "hooky-crooky", just a short phrase to describe someone who would use any means, legal or not, to acheive their own ends. This phrase later shortened to "hookey", and was used to describe those who shagged off work or lessons by the use of deception. I was actually only asking about the origin in terms of when John had written and where, but thanks for that extensive explanation as to the origin of the term itself, you learn something new every day! Sorry about that, LuvLennon - as for when and where John penned that originally, I'd read it somewhere, but can't remember where. I seem to recall it was an actual book, though, not "The Daily Howl". <font size="2" face="Tahoma, Arial, sans-serif">Hey all! "By hook or by crook" was in his young hand. Challenge TeoTorriate in the Arcade! Challenge Beatnixo1 in the Arcade!